Details have emerged revealing Daesh plans to carry out terrorist attacks in Europe and the Middle East, a UK newspaper reported on Sunday. The Sunday Times said it obtained “a trove of chilling documents” about the planned attacks, including correspondence between Daesh officials in Syria and the group’s leaders. The documents were found on a hard drive that was dropped by a Daesh terrorist during a firefight in Syria earlier this year. Despite the group’s defeat from its last militant stronghold in Syria last month, the documents reveal how Daesh continues to run sophisticated international networks, move fighters over borders, pay for operations and plan bank robberies, vehicle attacks, assassinations and computer hacking, it was reported. One of the documents seen by the Sunday Times was signed by six Daesh leaders and addressed to Abu Bakr Al-Baghdadi, the group’s self-declared caliph, and his deputy. 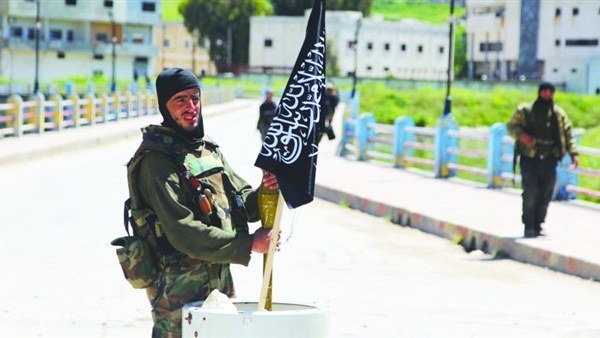 It splits up the group’s strategy abroad into two categories: Operations, which will be under the command of a Daesh member called Abu Khabab Al-MuHajjir, and borders. The document claims Al-MuHajjir controls a Daesh cell in Russia and two in Germany. Another group will be based in north-eastern Syria under separate command, the Sunday Times reported. The letter refers to the Paris attacks of 2015 and the “Manhattan attack” as inspiration, and states that the group’s first aim is to steal money to fund its plans. Specific targets mentioned included a high-speed train in Germany and an oil pipeline near the Swiss city of Basel, bordering France, chosen for the “economic disaster” they believe it would inflict. It goes on to explain the attacks in Europe will only be carried out by Daesh members already living on the continent. The letter said fighters from Europe, Russia and the Middle East are sent in and out of Syria through Turkey and Iranians and those from central Asia are brought through Iran. In the letter, the Daesh leaders also ask Al-Baghdadi for $10,000 to buy a gun, a motorcycle and a range of electronic goods, including laptops and flash drives.